Encourage the person to bathe herself as much as possible. She may be able to do all but wash her feet or back, or she may only be able to hold a washcloth while you do the rest. 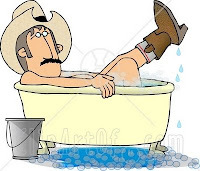 * If bathing is difficult, do it only as often as necessary. * Most people don’t need a daily bath. Do make sure that the hands, face, and genital area are washed every day. * Have all supplies ready before starting a bath. * Keep the room comfortably warm. * Respect the person’s privacy. Keep her covered when possible. * Wear latex gloves any time that you may come into contact with bodily fluids or feces. * Use a non-slip bath mat. * Ask her to sit on the edge of the tub. Then put both of her legs into the tub before she stands up. * Reverse the process when she’s getting out. * Buy or rent a tub bench. * Install a hand-held shower attachment. Giving a bed bath requires skill, but many family caregivers are able to provide this care. If the person is bed or wheelchair-bound, ask your doctor about getting a home health aide to come into the home to bathe the person. Or a trained caregiver may be able to teach you how to give a bed bath. Medicare or Medicaid may cover the costs of help with bed baths. Ask the doctor about this.